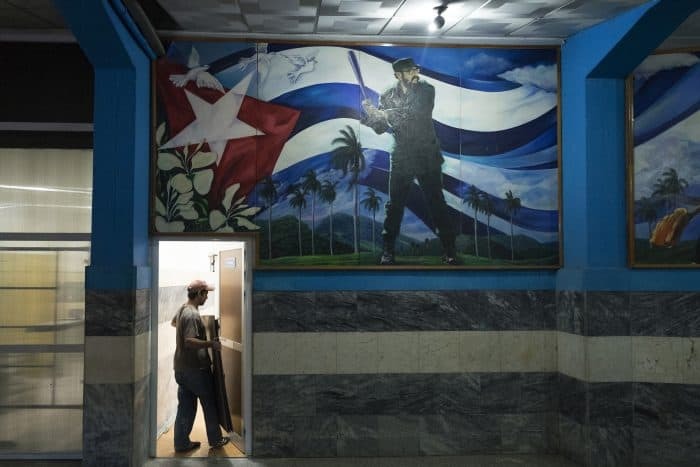 HAVANA, Cuba – Cuba’s communist government is trying an unusual diplomatic tool to crack the economic trade barrier with the United States: baseball. The Castro regime, the Obama administration and Major League Baseball have been privately talking for months to figure out how to allow Cuba baseball players to come to the United States legally to play in the big leagues. It’s a move that all sides believe could bind the two countries together over their shared love of the game and be a step in normalizing relations, which President Obama has said he wants to make “irreversible” before leaving office. After five decades of estrangement, the United States last year removed Cuba from a list of state sponsors of terrorism and reopened its embassy in Havana. This year, airlines are preparing to resume regular service between Cuban and U.S. cities. A steady stream of U.S. officials, including Virginia Gov. Terry McAuliffe (D) and D.C. Mayor Muriel E. Bowser (D) have trekked to Havana, making connections in anticipation of future investments and business opportunities. This month, Obama will become the first sitting U.S. president to visit Cuba since 1928, a mission billed largely as a gesture of good will. But the Cubans are pressing for something beyond symbolism. During his historic visit, Obama plans to attend an exhibition game between the Cuban national team and the Tampa Bay Rays, only the second such game played on Cuban soil since the Cold War. The sight of a U.S. president watching a baseball game in Havana – once unthinkable – could be just the pivot point needed for a deal, said top Cuban baseball officials interviewed recently by The Washington Post. 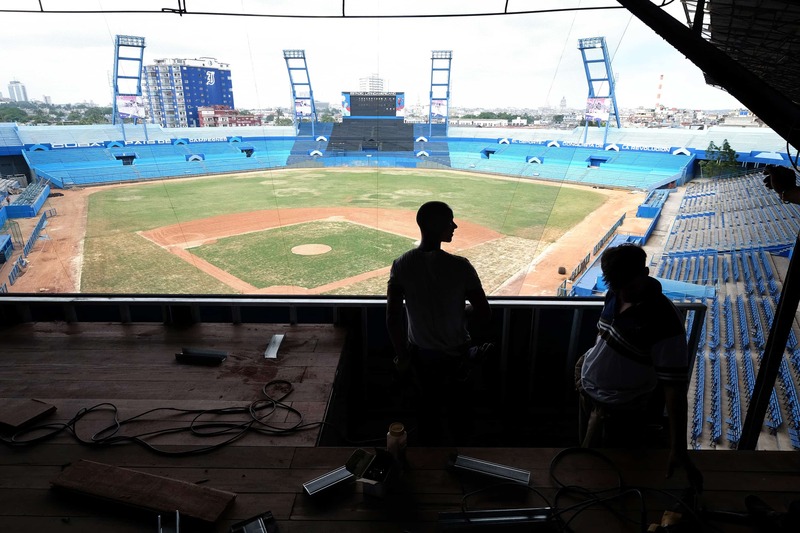 Senior officials with Major League Baseball, which is spending millions to refurbish a rusted Havana stadium and help put on the game, say the rare face time with Cuban officials will be beneficial. But it is unlikely that an agreement can be reached in the short term, they warned. Ben Rhodes, Obama’s deputy national security adviser and an avid baseball fan, has encouraged baseball diplomacy as a vehicle to reopen ties with Cuba. But for now, Obama simply plans to enjoy a ballgame, he said. Behind the scenes, several people with knowledge of the negotiations said money – specifically, how much could flow from MLB to President Raúl Castro’s government – is the reason a deal remains elusive. The trade embargo, in place since President John F. Kennedy was in office, blocks U.S. companies and citizens from doing business in Cuba, baseball contracts included. The Cuban government wants Obama to effectively exempt baseball players, which would allow them to sign MLB contracts without having to renounce their Cuban citizenship. The Obama administration has used executive action to ease some restrictions governing Cuba, but ballplayers remain problematic because they are represented by the Federación Cubana de Beisbol, the government-run league. Currently, Cuban players have to defect, establish residency in another country and, once in the United States, sign affidavits that they are no longer welcome or that they do not plan to return to the communist island before they can join a U.S. roster. Often, athletes flee with the help of smugglers or steal away when the team is playing in international tournaments. That’s how most of 20 Cuban athletes playing for U.S. teams found themselves guaranteed more than $130 million in salaries this year, including Chicago White Sox first baseman José Abreu, New York Mets outfielder Yoenis Céspedes and teenage Boston Red Sox shortstop Yoán Moncada, who received a $31.5 million signing bonus. In the 14 months since Obama announced his intention to restore ties with Cuba, there has been a surge in the number of Cuban players – more than 100 – who defected, mostly to play in the United States. The route can be perilous, putting ballplayers at the mercy of human traffickers, gangs and cartels as they cross Central America and Mexico in attempts to reach the United States. Seattle Mariners center fielder Leonys Martín was held at gunpoint in Mexico and his family confined to a house in Florida while smugglers tried to extort money from the player, according to the Los Angeles Times. Smugglers threatened to use a machete to cut off the arm or fingers of Dodger Yasiel Puig if he did not give them a share of his future major-league salary, Los Angeles Magazine reported. Cuban officials and MLB think that securing a new deal would increase safety for players. But it is unlikely that the league could move forward with a deal until its players contract expires in December, since it would have to address the number of Cuba baseball players who could enter the league and who would represent them, said Dan Halem, MLB’s top lawyer. Cuban officials say the deals they recently struck for athletes to play in the Japanese league offer a model for contracts with the United States. When star Cuban infielder Yulieski Gourriel was allowed to sign a one-year, $1 million deal with a Japanese team in 2014, the Castro regime took 10 percent as compensation for his Cuban government-paid instruction, player development and the loss that his talent represented for the island league. That is not unlike the financial transactions between MLB and other nations in exchange for international players. But no such agreement with Cuba has been approved by the United States, and the decision will be up to an obscure Treasury Department office that enforces the trade embargo,the Office of Foreign Assets Control, or OFAC. MLB has filed a series of proposals over the past year with OFAC, seeking a way to clear both the regulatory hurdles and political opposition from those who would view a deal as a new revenue source for the Castro regime. To assuage those concerns, MLB recently asked OFAC to approve a U.S.-Cuban nonprofit-like entity that would take a percentage of the salaries paid to Cuban players and spend it on new baseball facilities, youth sports programs and other sports-focused efforts, Halem said. In Havana, Cuban officials see the next two weeks as their best opportunity to press for a deal. 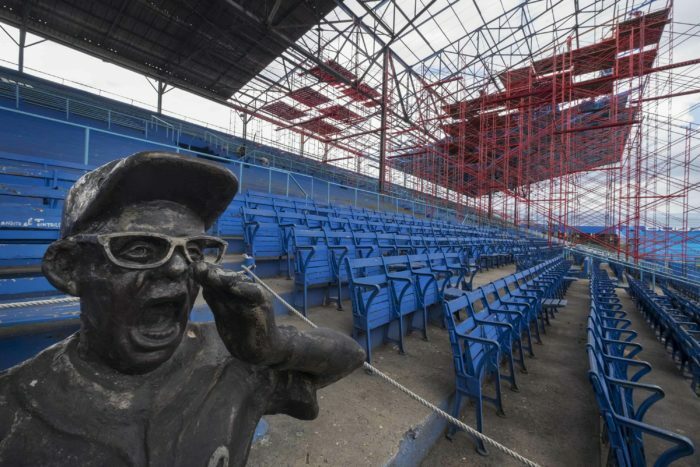 In Estadio Latinoamérica, the rusted blue stadium where Fidel Castro used to throw out the first pitch at games,the sounds of banging hammers and whirring electric saws echo against the scoreboard. Above home plate, crews are busily ripping out seats and constructing a VIP box for Obama. MLB has dispatched one of its top field gurus to Havana to help make sure the coming game with the Tampa Bay Rays goes off without a hitch. 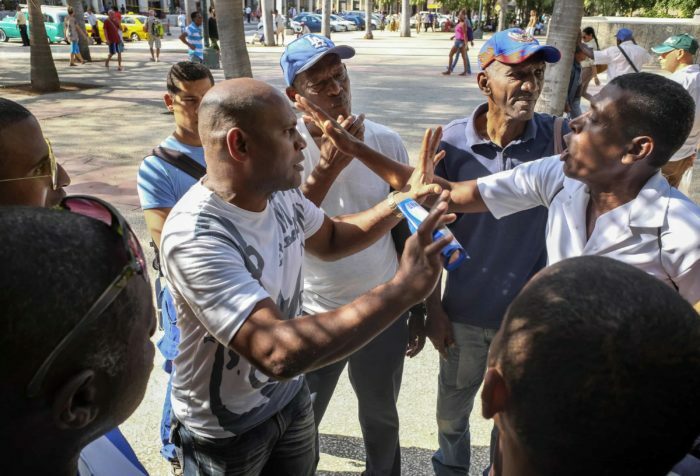 In Havana’s central park, where men gather each day to argue about baseball, the talk on a recent afternoon is about the Yankees and Red Sox, not the domestic Cuban league, where the caliber of play has fallen demonstrably as defections have risen. A deal here to lift the sagging fortunes of Cuban baseball can’t come soon enough for the government or the fans. Back at the stadium, Suárez and Higinio Vélez, president of the Cuban Baseball Federation, stay on message about the need for an agreement. “It is time,” Vélez repeatedly says. But Suárez and Vélez did not endorse the proposal pending with the Treasury Department. They did soften some earlier demands, such as requiring that players going abroad return to spend the off-season in the island’s storied winter league. And instead of routinely shaming Cuban players who have defected, the Cuban government has been muted in its response to one of its most embarrassing losses – the disappearance last month of Gourriel, regarded by many as the country’s best player, and his younger brother, both of whom reportedly resurfaced last week in Miami. Peter Bjarkman, who recently completed a book on Cuban player defections, believes a decision about a baseball deal has the full attention of the Cuban vice president, a sign of its importance. “The Cuban government is watching its baseball league disintegrate before its eyes, and it knows it has to change, but it still wants an arrangement on its own terms,” Bjarkman said, adding that if and when a deal is reached, the biggest question may be how many players Cuba allows to go to the United States. “They haven’t figured out how they can do it without losing their baseball entirely, and that’s the issue,” he said. Juliet Eilperin and Barry Svrluga in Washington contributed to this report.